Traveling is a wonderful opportunity to see new places, experience new cultures, and taste new foods. But when travelling, where do you stay? 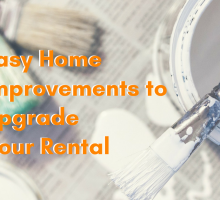 While Rentfaster is the place to look for long-term rentals, city hoping is served well by Airbnb rentals! 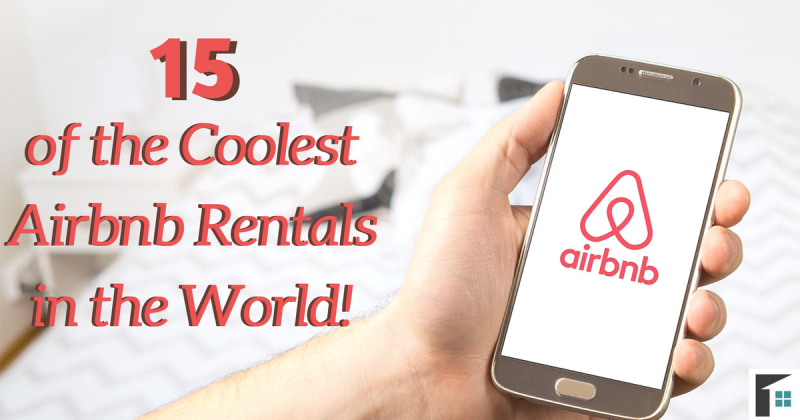 These amazing rentals are situated across the globe and each rental is different than the next. Perhaps you are searching for a gorgeous beach house or a cozy cabin, or maybe an authentic castle is your dream getaway. No matter where your travels lead you, there will be an Airbnb rental that has just what you are dreaming of. Home is always where your heart is, but sometimes a trip away from home can be just what the heart needs! Here are 15 of the coolest Airbnb rentals in the world! Have you ever dreamed about living in a castle of your own? Dream no more, because with Airbnb rentals like this you can have a small castle to yourself. Located in the north of the United Kingdoms, this quaint castle is as good a getaway as any beach resort. 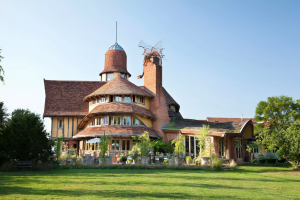 The cozy castle, fit for two, features a log-burning fireplace, spiral staircase, and is only a four-mile drive from beautiful beaches. 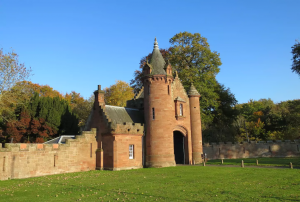 If you want to stay in a castle with the comforts of home, check out The Gatehouse to Ayton Castle for your next vacation. If a house or condo is too blasé to peak your interest on vacation, there are more unique experiences available. Introducing, the Magic School Bus. This fun and unique rental is perfect for those who want to get away to the outdoors (but not too outdoors). This fun bus is equipped with LED lighting, recycled redwood walls, and an optional Kundalini yoga session (complete with gong mediation). Situated on 5 acres of land, bus renters are free to explore the area. 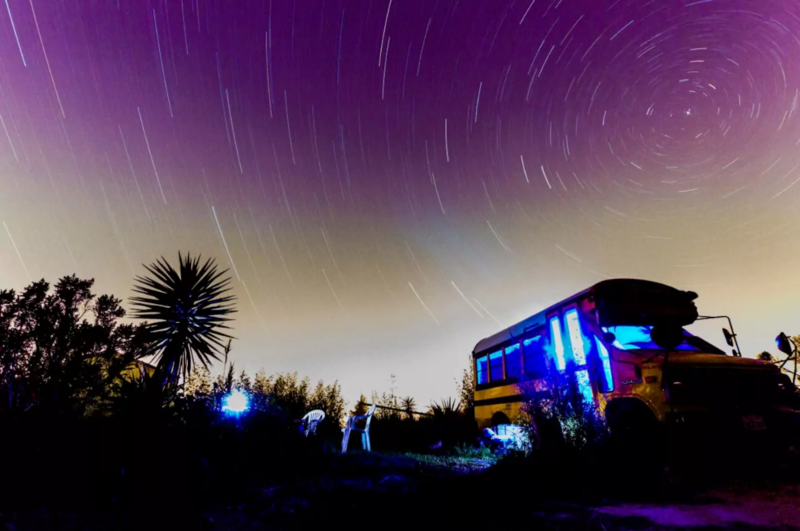 Defy the norm and choose Airbnb rentals just like the one-of-a-kind Converted Magic School Bus Adventure! If you get excited when you think of exotic places, The Cozy Palace could be just the Airbnb rental for you. 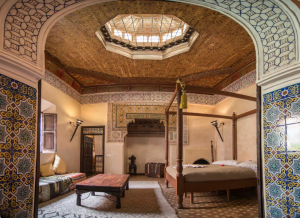 In Morocco, this quaint gorgeous Riad is the ideal place for those looking to feel like the upper class of the Mediterranean. The rooms are inspired by Moroccan culture and art, and a terrace on the roof gives you the perfect opportunity to stare out at the horizon. 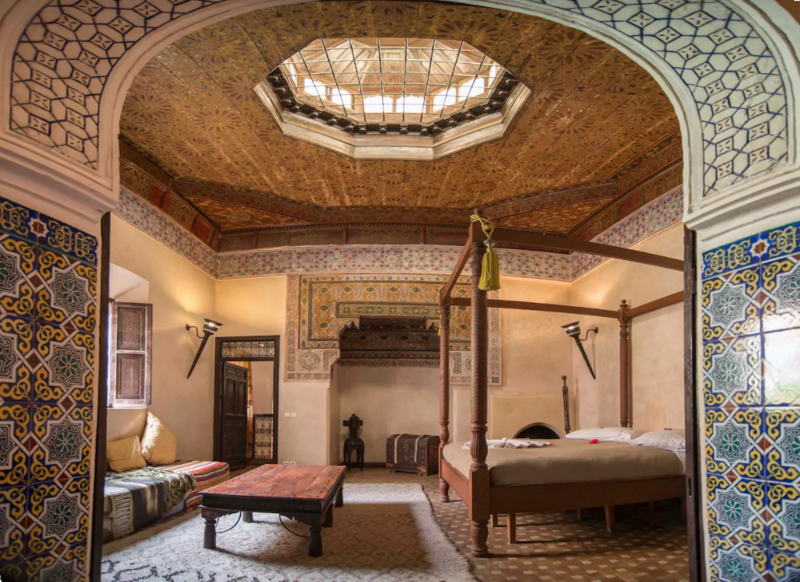 The tranquil palace will offer peace and relaxation in a traditional Moroccan home! 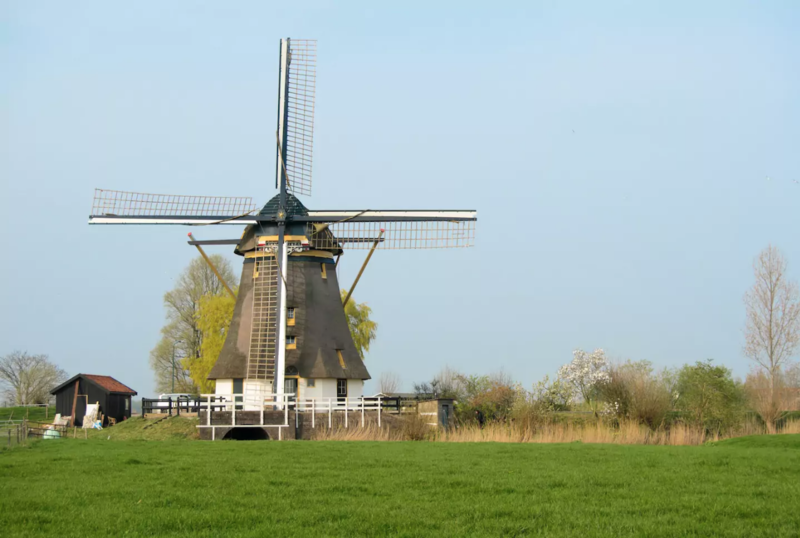 If unique is what you desire in your Airbnb rentals, then this windmill in the Netherlands will leave your head spinning. With true rustic, large wooden beams, you will live inside the windmill body itself. Complete with kitchen, dining area, bedrooms, and bathrooms, inside looks just like home. When rented, the entire windmill is yours to occupy, up to the tiny bedroom hidden the higher beams of the structure. 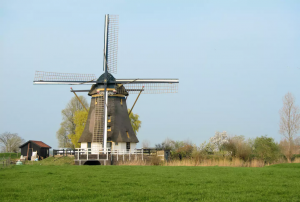 The rental is close to Amsterdam (15 minutes away) so you can enjoy the capital while also experiencing the countryside. Your perfect island vacation is waiting for you in Placencia, Belize! 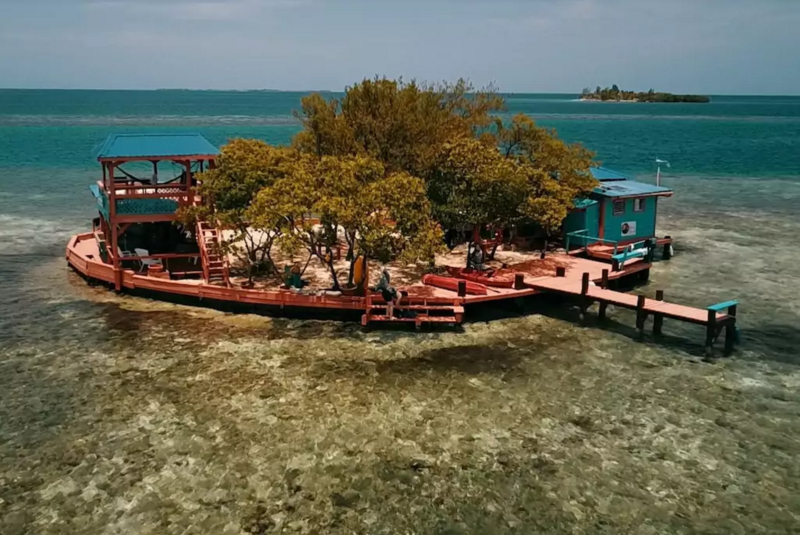 Although this private island is more expensive than other Airbnb rentals available, you are definitely getting your money’s worth. 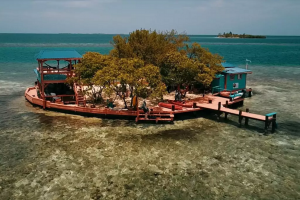 On Bird Island, you cater to yourself and make your schedule as you go – the remote island offers total privacy and is fully accessible to you alone. Activities involve kayaking, snorkeling, swimming, and all-day hammocking! If you are looking for a rental that gets you away from the busy city, Bird Island is as good as it gets! 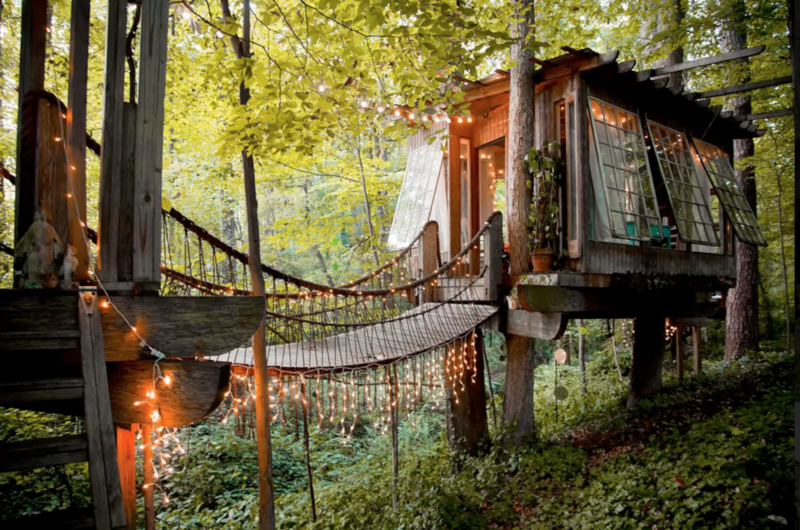 Some Airbnb rentals allow you to immerse yourself in nature, but how much closer can you get than a treehouse? 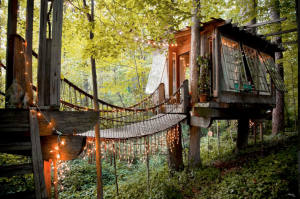 Secluded in the middle of Intown Atlanta, this treehouse is a ‘young at heart’ paradise. It has 3 separate rooms connected by a rope bridge, each room offering its own wonderful unique experience to unwind in. The rental is only able to cater to 2, which is all that’s needed for couples to spend some quality time together in the trees. For those who are not ready to commit to the outdoor lifestyle, there is a washroom available as well as a fan and mattress warmer to battle the elements. The treehouse is complete with twinkly lights, giving the rental a magical feel. 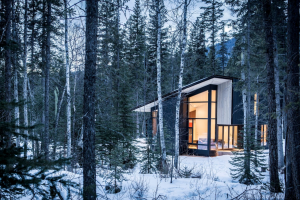 Perhaps your vacation goals are to get you into the trees, but not be “roughing-it.” Introducing the modern cabin – they best way to stay in the trees while having access to everything you need. 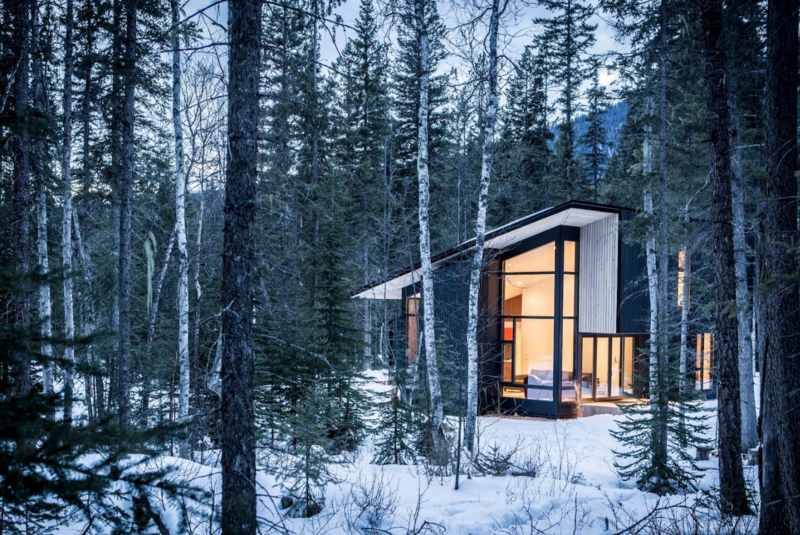 This modern cabin has large windows, vaulted ceilings, and beautifully designed bedrooms and a fully functional kitchen. All your needs will be met inside, so you can enjoy your adventures outside. The cabin is located on the Blaeberry river and is surrounded by the best hiking trails and mountain views. 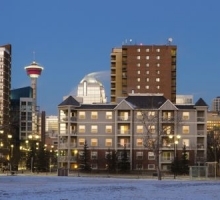 This is one of those Airbnb rentals that is good for any time of year, but is especially cozy for those Canadian winters! Staying in London? Want to stay in a clock tower? This guest suite available in the clock tower apartment of St Pancras Station is one of a kind. The apartment looks out over the famous Kings Cross Station and is fully furbished. The style of the rental is cozy, with brick walls and wooden flooring, complete with modern touches in other rooms. Many of the rooms include filled bookshelves, enough to convince any bookworm to stay for months! Step out of this Airbnb and right into a scene from ‘Little House on the Prairie’! 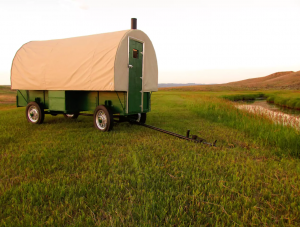 Understand what the sheepherder lifestyle was like by renting out this restored sheep wagon. The tiny but unique rental truly offers an experience of a lifetime, as you live in extremely close quarters. The wagon contains one bed, a small table, a wood burning stove, and cold boxes to keep your food cold. Located on 30,000 acres of a family ranch, you are able to explore the area and its activities (hiking, fishing, hunting, and biking). Once you have lived in this wagon you will get a glimpse of what it was like to live in the past! Instead of staying in a castle with the comforts of home, you can stay in a castle with the comforts of stone! This beautiful castle in France (dated back to the 1400’s) has all the features of a traditional castle like those seen on the big screen. 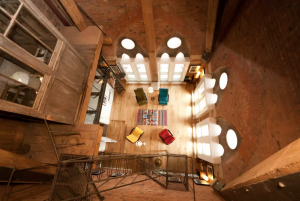 Spiral staircases, stone walls, arched doorways and windows – this rental will fulfill your medieval fantasies! A few villages are located close by that allow you to explore Aquitaine, France during your stay. This is one Airbnb rental that will offer you peace and quiet and amazing views while you treat yourself like a king. 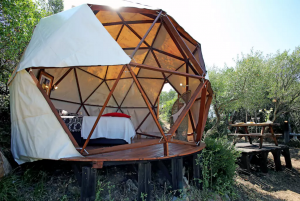 Laze in the sun, enjoy the fresh air, and sleep in a geodesic dome. One of the coolest Airbnb rentals is found in Spain – a giant igloo on a wooden platform. The group of dome rentals is an open concept that has a community kitchen and a risqué outside shower and Moroccan styled-toilet. 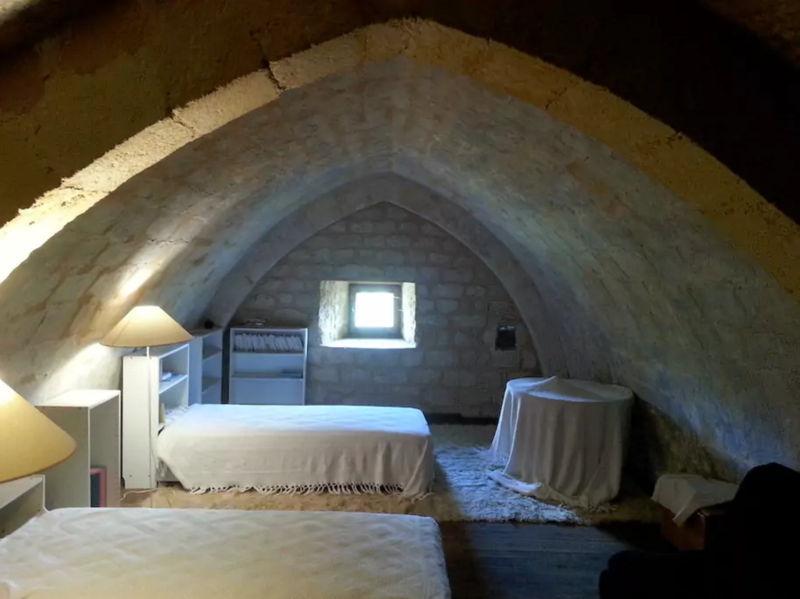 The domes are quite small and have only a single bed and limited furniture, everything else (table, bathrooms, etc.) is outdoors. This is one rental where you are free in nature – and with a gorgeous view to boot! 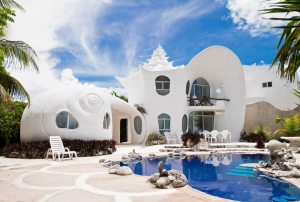 All Airbnb rentals have their own unique charms and qualities that draw interest, but none so much as the Seashell House. This world-famous rental is made for any beach-seeker who would prefer to avoid the crowds. Once rented out, the entire home is available for private use including the gorgeous house-front pool. Not only is the beach theme on the outside of the house, but is carried inside with its sand-sculptured furniture and seashell décor. In this Airbnb rental, you can truly feel like you are living under the sea! Are you a fantasy nerd? Come and stay in this creative house and enjoy the colors and sights of the “fascinating and unexplored.” With the surprising dragon located on the top of the house, the interior is just as curious. Each room has unique colors and design, filled with books, one of a kind furniture, and cultural artwork that will keep you in awe. While staying here, you have access to the summer house, which is a finely decorated outdoor space perfect for reading, taking a nap, or just relaxing. Come and explore the creative, because anything could happen when there be dragons about! 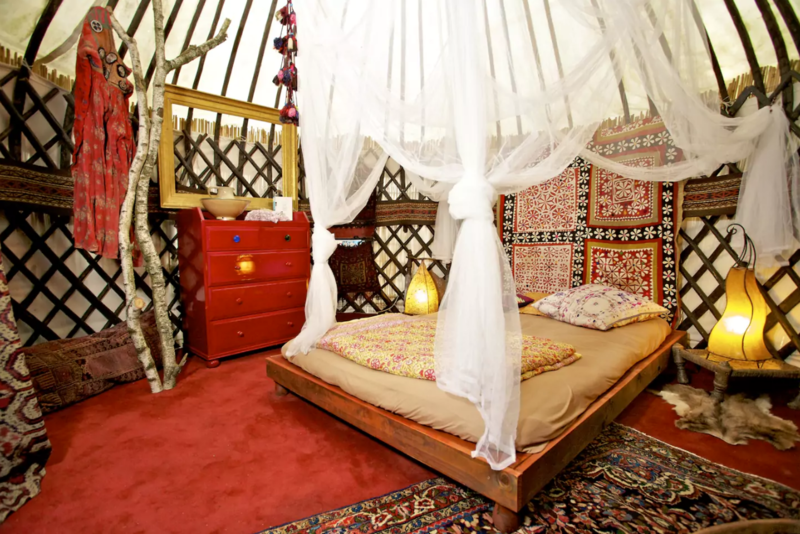 If you are searching for something a little more spiritual, this Afghani Yurt in Germany will ground you. The yurt has a comfortable bed, electricity and candles, but all else is outside. There is no running water, and if water is needed a basin is available. Located in a garden, the pool is the best enjoyed on hot days (with a shower available). This serene area will have you on a spiritual journey in no time. 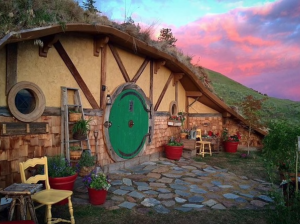 If you are a fan of The Lord of the Rings or The Hobbit, there is an Airbnb rental awaiting your arrival! Located in Washington, United States, this underground hygge rental allows you to live like a hobbit with the home’s round shaped door and natural décor. The earth home looks out on to the Columbia river as well as stunning local hills and orchards. Inside the small home is a bed for two, a fireplace, small bathroom, and a quaint sitting area. If a trip to New Zealand is not in the budget, this hobbit hole is second best!